Are you wondering how you’re going to manage your upcoming summer travels with an infant while juggling baby, diaper bag and your luggage? Maybe wondering what you’ll do with your child’s car seat if you’re flying? Or are you worrying about whether you might be charged extra by the airline if you have a car seat and a stroller? Perhaps you’re concerned because you need the car seat at your destination and it sure would be nice to have a stroller too? 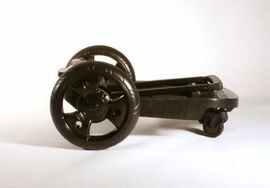 The GoGoBabyz Infant Cruizer is truly an innovative product which can help with some of these questions. If you’re flying, you can leave your stroller at home and just use the GoGoBabyz Infant Cruizer in the airport and at your destination. 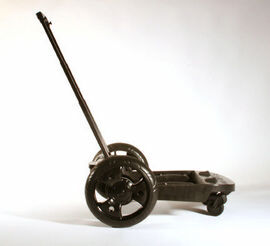 The sturdy AT (All Terrain) wheels provide a gentle ride on a variety of surfaces. Going up or down stairs? No problem! The telescoping handle easily retracts and you can lift the car seat and wheels while riding up an escalator or taking the stairs. The fold-up design means the Infant Cruizer takes up significantly less space than a traditional travel system stroller – a bonus for both air and car travel. At 12 pounds, it’s light enough that you also don’t need to worry about extra baggage fees. The Infant Cruizer comes in two models: the INCR-Graco for Graco car seats and the INCR-Other for car seats from Britax, Combi, Chicco and Peg Perego. And, thanks to the good folks at GoGoBabyz, I’ve got an Infant Cruizer to give away – check out the contest below. 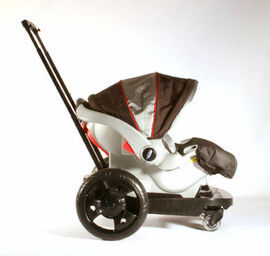 You can WIN a GoGoKidz Infant Cruizer! 1.) To enter to win, leave a comment below with how and where you’d use the Infant Cruizer and how you think it will make your life easier! One winner will be chosen at random. This giveaway is open to those with a US mailing address. 2.) Email subscribers get an extra entry for as long as their subscription is active. Already a subscriber? Leave me a separate comment on this post to let me know you’re interested in this giveaway. Want to subscribe? Just click here: Subscribe to Wandermom by Email or RSS. 3.) You’ll get one extra entry for every social bookmarking site you submit this post to (examples: Digg, StumbleUpon, posting on Facebook). Leave a comment for each with your user name. 4.) Twitter about this giveaway (include a link to this page and @Wandermom) and comment here with your Twitter name. 5) Blog about this giveaway, including a link to this post.! You have lots of chances for extra entries! This contest will close July 7th, 2009, 11:59 CST. This contest is also posted on Contests For Moms.